I'm 23, young, adventurous, looking for a good time. So what am I doing on a Saturday night in California? Blogging. Because there is nothing else to do in the desert. I did go see a movie tonight though. 16 Blocks, with Bruce Willis. Absolutely horrible. Wouldn't wish it on anyone. This isn't a sob story, its not a plea for pity. I really did wake up this morning and not realize that it was my birthday. It was a semi-Frank the Tank moment. There's no excuse for it really, I mean I was talking to both my mom and my girlfriend the night before about it, its just that it didn't cross my mind until about midmorning when Amanda Bales called. My phone started ringing, I couldn't answer it, but I noticed that it was her. Now, we try and stay in touch, but we're pretty bad about it, so when I saw her name I thought, "hmm, I wonder what the occasion is?" (silence). About 15 minutes later I figured out that she was calling because it was my birthday. Thanks Amanda, that's why I keep you around. Didn't really do anything exciting for my birthday today. All the new guys that I reported in with last week went and we got all of our gear. So I guess that was kind of like receiving a bunch of birthday presents, most of it was new, so that was exciting. I'll post a picture of some of it at the bottom of the post. My real present doesn't come until tomorrow. That's when all the senior Marines in my platoon are going to gang rush and then proceed to beat the crap out of me. Literally. I mean, there is going to be marks. Maybe I'll post pictures of those too, better yet, maybe I could get actual footage of it. I intend to put up a fight, but lets be honest, they might as well stick a bunch of bananas in my pants and turn a monkey loose. My friends, appreciate where you live. Because right now, at this very moment I am rotting away at 29 Palms, more affectionately known as 29 Stumps. I'm starting to settle in with my new unit, we were all split up into the various companies, platoons and squads of 2/7 this week. 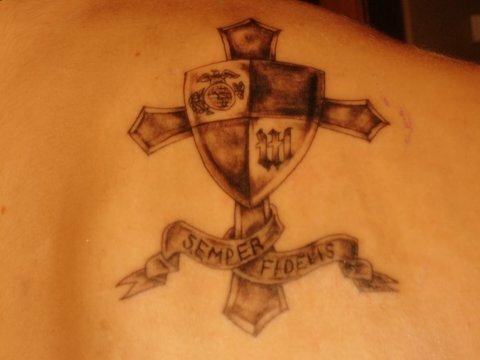 I fall into the mix as follows- SAW gunner, 3rd Fireteam, 1st Squad, 3rd Platoon, Golf Company, 2nd Battalion, 7th Marines, 1st Marine Division, USMC. Mouthfull isn't it? I was lucky to get place in a really good company, the Golf Gunfighters. This past Friday the battalion had a memorial service for the Marines they lost five months ago when they were in Iraq. It was very sobering to see the Marines memorialized in front of friends, family and comrades. What they did was set up memorials with sandbags that had a rifle bayoneted in it, with their helmet on top and their boots in front. Then the Sergeant Major called the battalion to attention and took roll. The first couple of names he read off were met with a response of 'present', then he began to call out the names of those who had been killed. As he continued to repeat their name, a Marine walked out carrying their dogtags and presented them to the Sergeant Major, and then they hung them from the rifle. I didn't even know any of them, and the scene nearly moved me to tears, and I wouldn't have been the only Marine crying. President Bush is here this weekend. I walked out my room to see Marine 1, the helicopter version of Air Force 1, flying low over the barracks preparing to land, biggest freakin chopper ever. Needless to say this place is on total lockdown right now. My unit is scheduled to go to Iraq in January for a 7-8 month tour. We'll be headed to the al Anbar province, and were sending out an invitation for the terrorists to meet us there. If you feel like writing me, my address is as follows. Well, the orders came. On Tuesday I will graduate from the School of Infantry and getting on a bus headed towards 29 Palms, California, to join the 2nd Battalion, 7th Marines. 2/7 is a great infantry unit that has a lot of history, and has recently been writing more in Iraq. As of now, we are scheduled to go back to Iraq in either August or September, so I'll be having the oppurtunity to do what I joined to do. Unfortunately I'll be doing it out of 29 Palms, which is in the middle of the California desert. It gets to be about 120 degrees there, yaayyyyyy. Good news is I'm only two hours from Vegas, I guess that could be bad news though...you'll know if I start asking you to borrow money. Well, Bravo Company is coming up on its last week of training at the School of Infantry. The last couple of weeks have been full of nonstop high speed training, basically we have had warfighting shoved down our throats everyday since my last post. Alot has happened since I was on here writing last. We split the company up by infantry specialty around week 3. I chose to train with the 0311's, your basic rifleman. Essentially my job is what you would typically think of when you imagine an infantryman. There are two platoons of 0311s, I'm the guide for 2nd Platoon, so I'm in charge of about 95 Marines right now. It's kind of like baby sitting, but in the end its rewarding. The third platoon is made up of the other infantry specialties- mortarmen, assaultmen and machinegunners. The life of an 0311 pretty much exists in the field. We hike all day, go to ranges, practice squad assaults, patrolling, ambushes, etc, and then we sleep under the stars. There have been plenty of nights where we have woken up with a layer of ice on our sleeping bags, or puddles of mud under them, but that's what makes it great. This past week we began training for urban warfare, or MOUT as the Marines call it, Military Operations in Urban Terrain. We headed out to a mock town and practiced house to house fighting and room clearing techniques, it was pretty sweet. Kind of felt like you were on SWAT. This next week we have a culmination training exercise where we'll spend 3 days at MOUT town pulling everything we've learned all together. Some crazy stuff has happened during training though. About three weeks ago we were out in the field, waiting for it to get dark to do some assaults at night. Naturally we had some time to waste, so our instructors did what any trained killers would do, they organized a bull in the ring fight. Two platoons made a giant circle and Marines were allowed to go to the center and call out anyone they wanted for a no-holds barred ground fight. I was just sitting there waiting, because, as the guide, I knew EVERYONE wanted to call me out. Turns out Mikael, a kid I had in my platoon at boot camp, walks to the center and calls me out. Well it turns out that Mikael teaches martial arts techniques to police officers back in his hometown. We started the fight and initially I was beating him on brute strength, it went back and forth for a while, with him getting me in various choke holds and me reversing him and trying to beat him mercilessly. Eventually, he worked his way behind me and put me in a rear naked choke, but I had one of his arms locked out in an arm bar. Turned into a "can he choke me out before I rip his arm off" type thing, I mean, who hasn't seen that one before? Well, eventually I passed out and came to a couple of seconds later to hear everyone cheering him on. Haha, real freakin' funny I know. I got bonus points for passing out before tapping out though. The other crazy thing involves the wildlife. Camp Pendleton has a bit of a rattlesnake problem. I hadn't really encountered it until I was getting ready to set my pack down on the ground about 2 weeks ago and realized I was setting it on a rattler. Long story short, my instructore took my rifle and shot it with a blank. Now, you may be thinking, a blank? Well it creates enough air pressure to rip a rattlesnake head in half, which is pretty freaking cool to see. Well, graduation is in a week and a half. 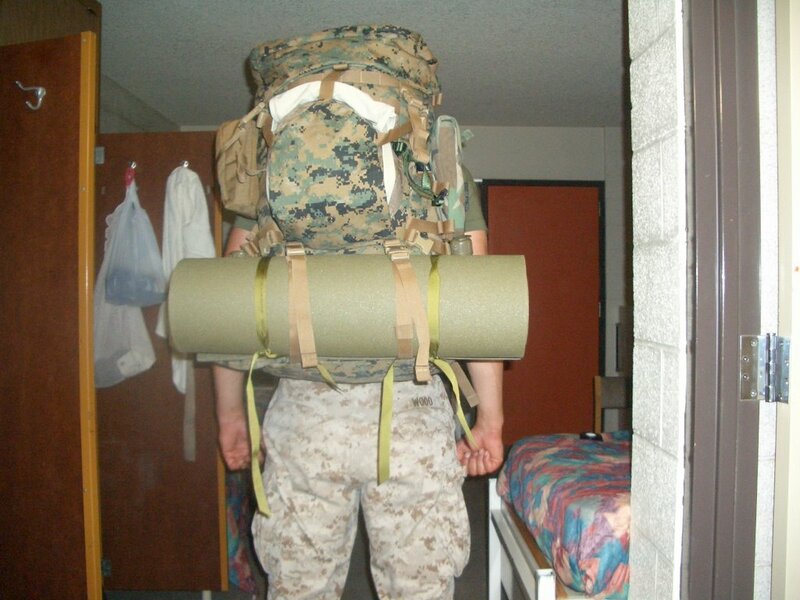 Unless I screw up big time, I'll be graduating as the platoon honorman. 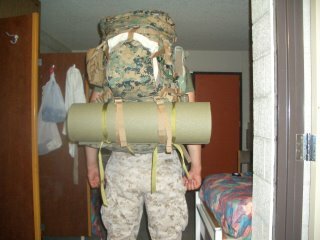 I still don't know where I'm getting shipped to for a permanent duty station, but I hope I stay put in Camp Pendleton. 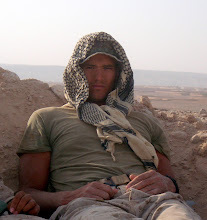 There's a chance they'll throw me in the middle of the desert at 29 Palms, or in North Carolina at Camp Lejeune. I'll be sure to let you know.